I also can’t believe how well the luggage has held up. It’s been all over the world! The worst that’s happened is a few scuff marks….and my wife has found the PERFECT thing to use to clean the luggage – Mister Clean “Magic Erasers” – i should get an endorsement fee for recommending them :-). She found that if you dampen the erasers (which you can get in any grocery store) and rub them lightly over the luggage, they take off everything and make the pieces look like new again. 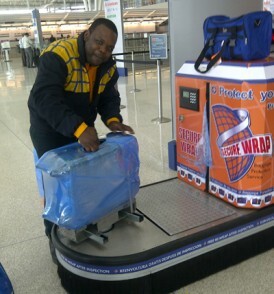 I also discovered this cool new service that’s starting to take hold in airports….it’s called “Secure Wrap.” It’s done by a company that has contracted with airports all over the world. I think they are only in a couple of airports in the US but are looking to expand. We came across them at the Indianapolis International Airport. For $9, they’ll wrap your luggage in shrink wrap to protect it. They even work with airport security so that if they need to get inside your luggage, they’ll open it and then have it re-wrapped before it goes on the plane. 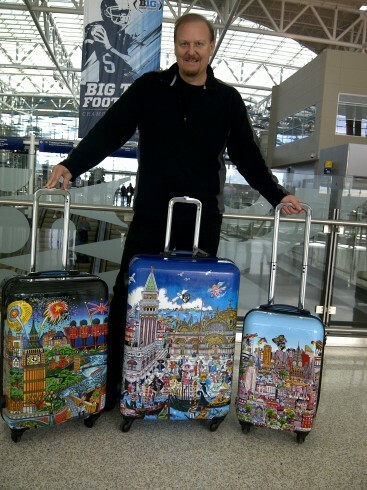 It’s very cool and takes only a minute or so….another good way to keep the luggage looking brand new. Oh, and they insure you against damage! I CAN guarantee you one thing – you’ll NEVER lose site of your luggage on the carousel as it comes off the plane! I just love it and am so proud of it! Neiman Marcus and Macys’ (in store) are the best places to get the collection. Or you can see it on our website in the gift shop. Happy Holiday Shopping and Traveling! !